Why is natural gas the best fuel for your cutting table? For equal quality cutting performance natural gas is up to 90% less expensive than acetylene, propane/LPG or propylene and based on new extraction technology it looks like natural gas will remain inexpensive for a long time. When comparing the cost per 100,000 BTUs for common industrial fuel gases natural gas has a clear advantage! Natural gas itself is safer than any other fuel and a G-TEC Torch Booster eliminates cylinders and bulk tanks of fuel gas from your plant because it is connected directly to the utility gas pipe. Never run out of gas - your gas utility has an unlimited supply! Which G-TEC Torch Booster is the right choice for your cutting table? 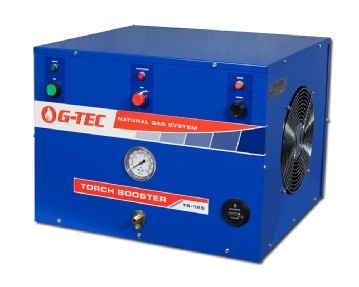 G-TEC Torch Boosters are designed to be installed right in the area where you need high pressure natural gas and are placed between the low pressure utility gas pipe and your cutting table. Turn the Torch Booster on when you are ready to cut and it automatically adjusts to supply exactly the right amount of high pressure gas. Torch Boosters are quiet, do not need any special site preparation and are Certified by CSA International for installation in any building in North America. G-TEC Torch Boosters are also CE Compliant for installation in Europe. G-TEC Torch Boosters are available in both 208 VAC 60Hz and 230 VAC 50 Hz configurations. 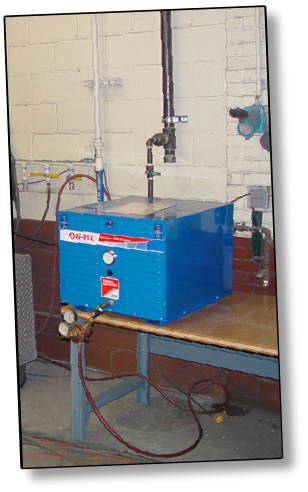 G-TEC Torch Boosters do not store any gas - they boost pressure and supply gas to your cutting table as it is used. 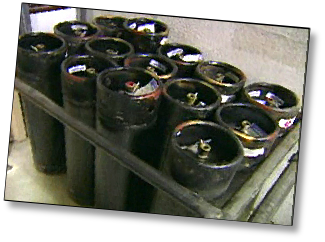 Moving and changing propane and acetylene cylinders increases the chances of an accident by mishap or simple poor cylinder handling practice. Bulk tanks store a lot of energy and can contribute to making an accident even worse. The Fire Marshal will like you better and your insurance carrier may reduce your rates when you remove stored fuel gas from your property! Very little slag - clean edge -high quality cut! your work calls for many pierces! 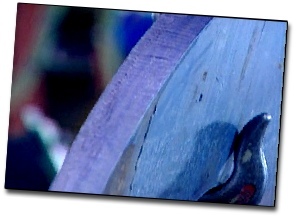 People question whether natural gas will work well for cutting plate steel. Often this is because their only experience has been with low-pressure natural gas using injector style torches. When high pressure natural gas is available it cuts quickly and a G-TEC Torch Booster can elevate standard utility gas as high as 45 psi. 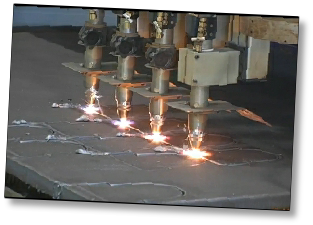 We can calculate how much money you’ll save with natural gas, explain how to install and operate a G-TEC Torch Booster, help select the right unit for your cutting table and tell you more about the benefits of high pressure natural gas for torch cutting. TB-250 Torch Booster is the right choice when you have four ALFA Torches. Messer ALFA cutting torches require a utility gas supply pressure between 25 - 28 psi. When the gas utility can’t deliver - a G-TEC Torch Booster will do the job! Does your plant run more than 2 shifts per day…is ambient temperature above 90F…is downtime valued in the hundreds of dollars per minute? A Heavy Duty Torch Booster is the right G-TEC system for tough operating environments. Temperature is regularly above 90F. 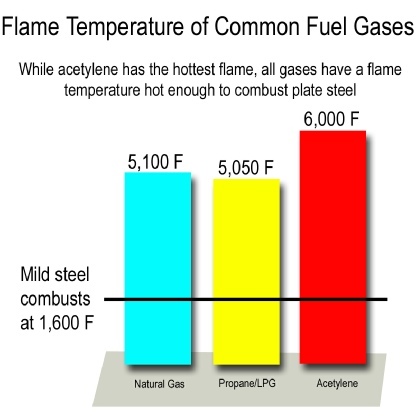 A BTU is the same whether it comes from acetylene, propane or natural gas. With natural gas you’d need 100 cubic feet of gas for 100,000 BTUs, for propane you’d need 4.63 LB and for acetylene you’d need 68 cubic feet for 100,000 BTUs. When making an “apples to apples” comparison with a common BTU denominator natural gas is a clear winner!